You can have the best deadbolt locks, the most secure windows and the loudest alarm—and still be in mortal danger. What from? Your house. Your castle. Su casa. Or, more accurately, the products contained within. Today’s criminal risk isn’t necessarily a thief climbing through your window in search of your purse or jewelry. Rather, these thieves are robbing your health on a daily bases. The worst part is – you’ve invited them in. To begin, one should know how to pronounce phthalates: [THAL-ates]. A group of plasticizers that are used to make plastics more flexible or resilient, phthalates soften plastics and are used in PVC (polyvinyl chloride) products and many children’s toys. They are found in home goods such as PVC shower curtains and vinyl flooring, adhesives, wall coverings, shampoo, nail polish, hairspray, lubricants and wood finishers. They are also used to hold color and scents in certain products. They are ubiquitous in commerce today and virtually unavoidable. The most common health risk of phthalates is endocrine disruption (ie: they are potent hormone disruptors linked to reproductive system issues). Researchers at the Universityof Rochester’s school of medicine found evidence in 2008 that phthalates may have feminizing properties in humans. Not surprising considering EWG’s (Environmental Working Group) Chemical Index states, Several phthalate compounds have caused reduced sperm counts, testicular atrophy and structural abnormalities in the reproductive systems of male test animals, and some studies also link phthalates to liver cancer, according to the U.S. Center for Disease Control’s 2005 National Report on Human Exposure to Environmental Chemicals. Both the WHO (The World Health Organization) and the U.S. Environmental Protection Agency consider phthalates a ‘Probable Carcinogen.’ The first epidemiological study published in Environmental Health Perspectives, links exposure to phthalates found in household dust to rhinitis, eczema, and asthma in children. Phthalates can be found in products we use everyday. 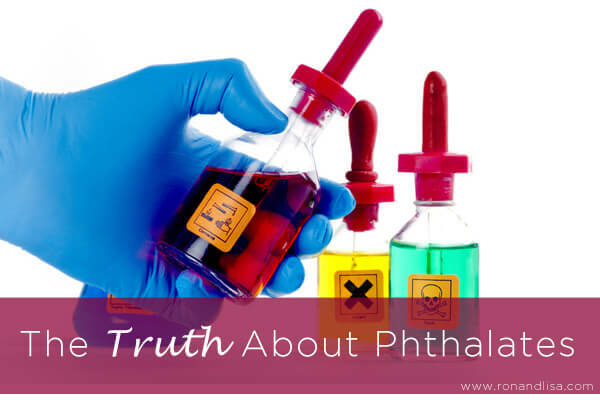 Phthalates have been found in indoor air and dust, and in human urine, blood and breast milk. To say phthalates are ubiquitous is an understatement. An EWG analysis of CDC data, called Beauty Secrets conducted in 2000, detected the presence of dibutyl phthalate in every single person tested. DEHP: Used mostly in PVC plastics, which typically can contain 30% DEHP by weight. DBP: Used in latex adhesives, nail polish and other cosmetic products, as a plasticizer in cellulose plastics, as a solvent in some dyes, and as a plasticizer in PVC. BBzP: Used as a plasticizer for vinyl tile, carpet tile and artificial leather, and also in some adhesives. 1.) Choose healthier personal care items. Get the EWG Skin Deep Quick Tips for Safer Cosmetics shopping guide HERE – perfect to carry in your wallet! 2.) Avoid plastic toys. Opt instead for wooden toys or organic cotton variety. 3.) Avoid PVC/vinyl flooring and shower curtains. Look for flooring made of reclaimed wood, tile, concrete, cork or natural linoleum. Choose hemp, organic cotton or linen shower curtains instead of vinyl. 4.) Avoid toxic air fresheners. Phthalates are used in air fresheners to maintain their lingering fragrance. Make your own instead with our simple & affordable DIY recipes! Give yourself a pat on the back! With the power of using our voices, in August 2008, a bill was signed to permanently prohibit three types of phthalates: DEHP, DBP, and BBP in concentration of more than 0.1% in “children’s toys” or “child care articles.” Also, the state of California announced an impending ban on the use of phthalates in toys and childcare products intended for babies and children under three years of age. Great info, thanks for breaking it down so that it’s easy to understand! Oh great – that was the goal Mauri…so thank you for sharing your feedback with us! We often hear terms being thrown around in conversation, many times without full comprehension of these chemicals. Our goal is to highlight each in a simple manner so our readers have a better understanding of exactly what they are, where to find them and most importantly…how to avoid them. Why didn’t you discuss phthalates in chicken? As I understand that is one of the main sources of exposure, and the variant (MEHP) is one of the most harmful to the body. I’m very glad that I found this article. Now, I will definitely use this useful informatsiiey and knowledge that I gained during its reading. Your 3rd link in the ‘What are the Health Risks’ section is obsolete. Could you please redirect me? Thanks for the link Ryan. Looks like the old link was no longer valid, so we replaced with the one you sent. Much appreciated! It is an great gifts of on your loved ones. I would highly incourage individuals to buy that things will make a ideal gifts. The actual transmitter will a good day task with buying that stuff regarding duration. I requested my material daily ago and I also reveived it really accelerated.